Exactly a month ago my grandmother passed away. 30 days, thats the same number of days that I've been delaying this blog post because I cant seem to wrap my head thats she's really gone. I fondly call her "nanay". I am the eldest granddaughter and when my parents were just starting their business in Caloocan, my grandparents helped in raising me in Cabiao. I think since I heard everyone calling my grandparents "nanay" and "tatay", I mimicked them. I'm also a self proclaimed favorite apo although nanay would say that she loves us all equally. I still remember that even at the age of 15, I used to sleep between them. You might wonder why Im sure of the age, its because my dear "tatay" passed away when I was in high school. 11 years ago my tatay battled and lost to colon cancer. It was a difficult ordeal that our family went through. Unfortunately, cancer won again as nanay succumbed to bone cancer after fighting for almost 5 years. I still remember her last 3 weeks vividly. It was Monday and nanay was scheduled to be confined that day, my brother texted me that we dont have electricity so I went to yoga and strolled to the mall. I went home by 10pm and nanay, daddy and tyang lita was on the sala. Daddy was on the phone, he was speaking to the doctor who confirmed that they have an available room on Philippine Heart Center. Daddy said that they'll leave in 30 minutes, I took the time to ask nanay about her day and to tell her about mine. The conversation that I cant forget was when I was standing in front of her, nanay was sitting, she hugged me and said "Mei, pagod na ako". Good thing it was dark, the electricity asnt returned, because my tears began flowing. Trying to remain calm, with a shaking voice I said "punta ka nasa ospital bibisitahin kita, pagaling ka, hintayin mo pa apo mo sa akin e". During her last days nanay would often say that she wants to give up but I dont want encourage her negative thoughts so I used to divert her attention. Fortunately/unfortunately I saw that nanay's pustiso was on my favorite mug, to make the situation light, i joked that im never going to use my favorite mug again! She stayed on the hospital for about a week and I visited her on weekends. My cousin Jessica was there the entire time to take care of nanay. I was surprised when she was allowed to go home even though her condition did not change, she cant eat, she's too weak to move and uses a bed pan to pee. My aunts and cousins from Cabiao stayed on our house for about a week to help in taking care of nanay, these are the times that she cant even speak, she just nods and stay on her bed all the time. Finally, it was a Sunday and they went to Cabiao, nanay always want to stay there so they granted her wish. 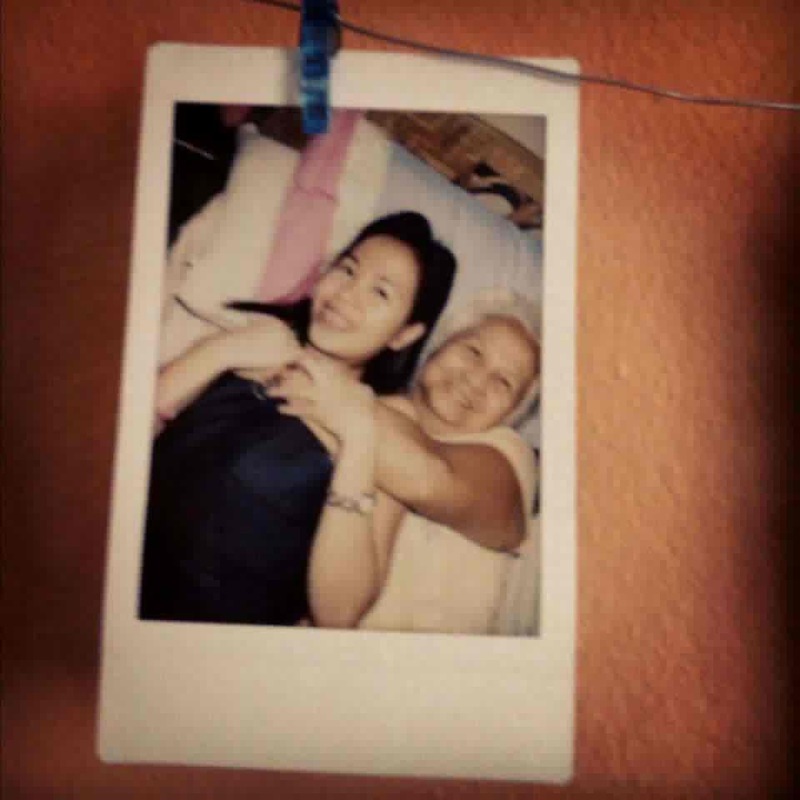 By that time I knew that nanay will be gone soon. By friday, I was texting my dad to ask about my tita from US who went home and also nanay's condition. Daddy said that its still the same, not getting any better :( That night, I went to a dinner with my high school barkada because our friend Pam was home for a short vacation. It was past 12midnight and we are talking about staying overnight on a friend's place. I cant make up my mind because my family and I will go to Cabiao to visit nanay by lunch time. My heart skipped when I saw a missed call from my tita Anne, I knew something was up. I immediately called her and she was sobbing "wala na si nanay" she said. I started crying but I just have 1 question, "did she die peacefully?" That was my only concern, she doesnt deserve anymore pain :( My aunt confirmed that it was a peaceful death, I started crying and hung up the phone. I said goodbye to my barkada and they escorted me to hail a cab. UP techno hub to Caloocan was a breeze, I went straight to my room and called my sister. She went to my room and we started crying. My tears are not all sad tears, its for relief as well. No matter how you try to prepare yourself, you cant accept death. I was crying because I will miss her and at the same time because she's in a better place. She can finally rest and be from all the pain and all her medicines that she tries to swallow every 3 hours. Nanay's bone cancer was already on 4th stage when it was discovered by the doctors. By that time they said she'll have 2-3 years but she lasted for almost 5 years. It was a good fight and I can say that as a granddaughter, I dont have any regrets. I cant remember the countless times I've styed overnight or accompanied nanay on her checkup at Heart Center, National Kidney Institute and UST Hospital. When she stays on our house for a week or two for her monthly check up, I always buy her YES magazine and her favorite lumpia from Goldilocks. We've spent countless hours skype-ing with my aunts, watching PBA games, Pacquiao fights or just talking about anything.